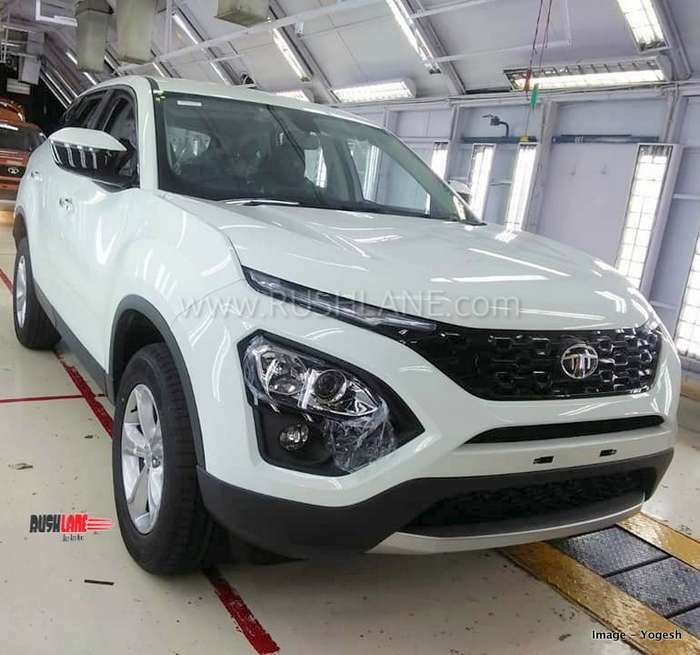 The Tata Harrier comes as a rival to Jeep Compass in India. Tata Harrier, showcased at the 2018 Auto Expo as the H5X Concept. The SUV has now been launched in India. It is now the flagship car on sale by Tata Motors. The new Tata Harrier is based on the IMPACT Design 2.0 philosophy. It is offered in a total of four variants – XE, XM, XT and XZ and at prices ranging from Rs.12-17 lakhs, ex-sh. Design elements to the rear include pointed LED tail lamps and moulded tailgate. The Harrier also gets flared wheel arches and sits on 5 spoke alloy wheels. Retaining most of the design elements as seen on the Concept, the Tata Harrier receives a distinctive front grille, low placed headlamps, high positioned DRLs and a sloping roofline along with a floating D Pillar. Tata Harrier is powered exclusively by a Kryotec 2.0 liter diesel engine offering 140 PS power and 350 Nm torque mated to a 6 speed manual transmission. The engine offers three drive modes of Eco, City and Sport. It also comes with terrain response modes of Normal, Rough and Wet – making it a highly capable SUV under any road and weather conditions. Rivals to the Tata Harrier are Hyundai Creta, Mahindra XUV500, Jeep Compass, etc. Priced from Rs 12.7 lakhs ex-showroom, here are the on road prices of all four variants of Tata Harrier in 11 major cities – Delhi, Mumbai, Pune, Ahmedabad, Hyderabad, Chennai, Patna, Jaipur, Kolkata, Lucknow and Bangalore. 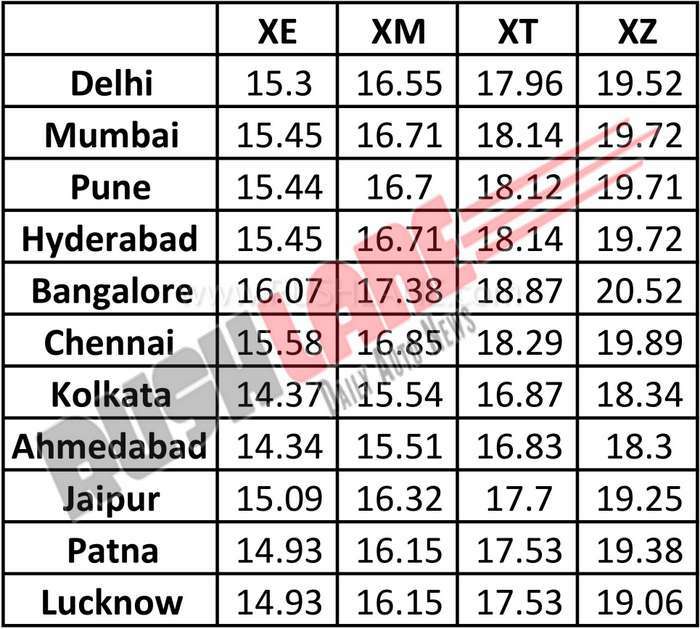 As you can seen in the detailed table below, prices of Tata Harrier is lowest in Ahmedabad, and highest in Bangalore. The price difference on top end variant is as much as Rs 2.3 lakhs. Its exteriors are seen in dimensions that stand 4,598mm in length, 1,894mm in width, 1,706mm in height along with wheelbase and ground clearance of 2,741mm and 205mm respectively. Interiors of Tata Harrier get a touch of class in every element. It is seen in a signature oak brown color scheme, soft touch dashboard, leather encased steering wheel, seats and door pad inserts while in terms of infotainment, the Harrier gets an 8.8” touchscreen infotainment system with 9 JBL audio speakers. Though this infotainment system does not support Apple CarPlay or Android Auto as on date, the company has stated that this could be made available soon. Interior comforts also include fully automatic temperature controls with HVAC, rear air conditioning vents and push button start along with adjustable driver seat. Safety features include a total of 6 airbags, ABS, EBD, ESP, traction control, hill hold assist and hill descent control along with hydraulic brake assist, etc.